When looking for a tasty seafood dish, you can never go wrong with prawns. Biologically, prawns and shrimp are actually two different animals in that shrimp have claws on two of their five leg pairs but prawns have claws on three of their five leg pairs. From a culinary perspective, however, they are interchangeable and are more likely to be called shrimp in the United States but prawns elsewhere. Supermarkets that sell prawns will call them by either name, though most often it will be larger, jumbo shrimp that are identified as prawns. They can be found at your local supermarket or anywhere that sells fresh or frozen seafood such as your local fish market. When purchasing prawns, you have a choice of buying them fresh or frozen. Both will work but frozen prawn will have to take time to defrost and are not be as flavorful as fresh prawn once cooked. They also tend to be tougher after cooking, so when you can, fresh prawns are the better way to go. Prawns can be cooked in a variety of ways, just as you would with other types of seafood. They can be grilled, broiled, fried, or steamed and can be cooked with the shell on or off. 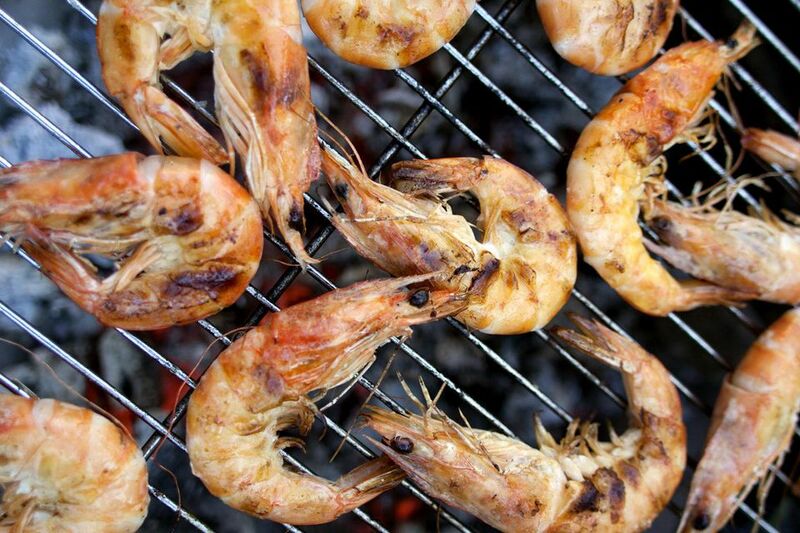 Prawns can also be cooked with the vein in or de-veined. Most people will remove the vein before cooking for personal reasons, but also because the taste can be gritty when bitten into. If cooking with frozen prawn, it is important to make sure that they are completely defrosted. This can be done easily by placing the prawn in a waterproof package or wrapping in plastic wrap, and placing in cold water for about an hour. Once defrosted, prawns are ready to cook and should be used immediately. Deciding whether to cook with the head and shell on or off is a personal decision. If you choose to cook without the shell, you will find it is a little easier to remove if the prawn is still slightly frozen. First remove the head by twisting it off. Next remove the legs, then, holding the prawn by its tail, pull the shell from the body. At this point you can choose to de-vein the prawn. This is done by taking a thin, sharp knife and running it along the vein. Run the prawn under cold water and the vein should wash away. When cooking prawns, one thing to remember is that they cook fast. If using prawns in a stir fry dish, wait until the last minute to add prawn as they will cook in as little as 30 seconds. Other methods, such as breading and frying, prawn can cook in under a minute.